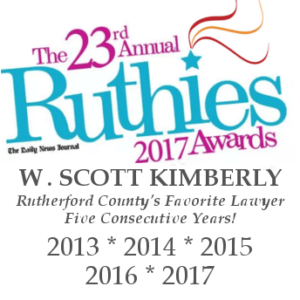 If you are accused of a crime in Murfreesboro, Rutherford County, or surrounding areas, and you need an experienced Criminal Defense Lawyer who devotes his practice to criminal justice, call Scott Kimberly. Time is a critical element when you are being charged with a serious crime. Your criminal defense attorney will need to gather evidence, testimony, and other facts as soon as possible, ensuring that the evidence remains intact and that the testimony is fresh on witnesses’ minds. Being on top of the situation will have more impact when you go to court and will increase your chances of winning your case. For Scott Kimberly, his most important job is to listen to you and help you identify and achieve your goals. There is no case to big and no case to small for our office to handle. Our office has represented individuals in criminal cases ranging from first degree murder, a Class A Felony, to disorderly conduct, a Class C Misdemeanor. We will not sit idly by while the government tramples your rights. Serious legal problems call for strong representation from a Murfreesboro Criminal Defense Lawyer who cares as much about the outcome of your case as you do. You can count on Scott to utilize every legal resource at his disposal in an effort to obtain a positive result in your case. The Law Office of W. Scott Kimberly handles all types of criminal cases. If you have been charged with a crime, we can help. Drug charges, from simple possession to trafficking or distribution, can result in serious consequences, which may affect your future and your freedom. Even minor drug charges can carry substantial financial penalties or jail time. It is critical to understand what you are charged with, what penalties you face, and your options under the law. Scott Kimberly has years of criminal defense experience. Our office has represented individuals charged with possession, manufacture, or distribution of illegal drugs, such as marijuana, cocaine, and ecstasy, and prescription drugs, such as Lortab and Percocet. Our experience defending drug charges allows us to offer insight on how the prosecution will handle your case, which puts you in a stronger position to protect your rights. If you are charged with a DUI in Tennessee, you face the threat of jail time, serious fines, and suspension or revocation of your driver’s license. Depending on where you work, a DUI conviction can also lead to employment problems. The penalties for DUI in Tennessee depend on the number of prior DUI convictions, increasing with each charge, and a fourth conviction for DUI can be charged and punished as a felony. A DUI can affect your reputation, your finances, your work, your transportation, and even your freedom. Scott Kimberly has extensive experience representing individuals charged with DUI and DWI. Our office is named on James Forslund’s DUI Directory. If you have been charged with a felony related to a violent crime in Tennessee, you have one chance to hire an experienced criminal defense lawyer to represent you. Murder and manslaughter are the most serious offenses that one can face. Other violent crimes, such as aggravated assault, domestic assault, and aggravated robbery, also carry significant jail time. Scott has represented several individuals charged with violent crimes. Scott Kimberly has earned his reputation as an attorney that looks out for his clients’ best interests. Our office will fight to protect your rights and, if necessary, we will use our experience to mount a targeted and strategic defense to your case. If you are in need of a criminal defense lawyer, contact us for a free initial consultation. We will listen to your side of the story, look at your charges, and advise you on the best path for you to take.